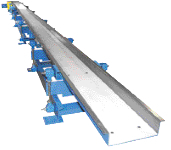 Prab, Kalamazoo, MI, introduces Quick Return (QR) conveyors that gently propel material forward without vibration or springs. A low-horsepower design coupled with permanent lubrication minimizes operating cost. The units suit single-press, dedicated units or can be used as a transfer system for plant-wide applications over long distances. Single units can range from 8 to 40 in. wide and as long as 60 ft. Conveying capacity peaks at 60,000 lb./hr., with load capacity to 2000 lb. and a maximum speed of 20 ft./min.